Facial cleansing brushes are the newest beauty trend on the market, promising to leave your skin clean and soft. They are designed to remove makeup and provide a deep cleanse to the skin that cannot be achieved with cleansing wipes or oil. But which one is right for you? We’ve rounded up the best cleansing brushes for your face in 2018. When picking a facial cleansing brush that’s going to be kind to your skin, it is always worth investing a little more in a Sonic cleansing brush such as the Cleansing by Clinique Sonic System Purifying Cleansing Brush, especially if your skin is prone to irritation. These vibrate rather than rotate, which is less harsh on the skin and the oscillating bristles extract dirt from the pores without over exfoliating the skin. You may also want to opt for a cleansing brush for face that doesn’t need replacement brush heads. The Foreo Luna Cleansing Brush is made from silicone and doesn’t require any further costs after purchase. Check out our full list below to find out what facial cleansing brush is right for your skincare routine. This silicone cleansing brush for face is great for those with sensitive skin as the soft bristles are not too harsh on the face. With 8 different modes, this cleansing brush is designed to remove dirt and makeup, as well as rejuvenate the skin for a younger, fresher look and feel. With no need to change the heads, this cleanser is great value and users are seriously impressed with the battery life, and it’ll even remember the mode you used last time for quick and easy exfoliating. Whether you have sensitive skin or not, this cleansing brush for face from Clinique is fragrance free and kind to skin. It won’t give you a harsh exfoliation, but instead will leave your skin feeling rejuvenated and fresh with its two bristle types that are designed to eliminate dirt from hard-to-reach pores. Users say the battery lasts forever and they have noticed a visible difference after using it for just two minutes a day. Whether you’re prone to excessive oil or annoying blackheads, this cleansing brush for face is designed to exfoliate the skin and improve absorption of your skincare products for healthier looking skin. It also features a toning mode which works to improve circulation so your skin feels tighter, firmer and looks younger. The great thing about this little brush is that it comes with a wireless USB travel charger so you can stay looking fresh on the go. This cleansing brush is praised for being gentle yet thorough on the skin. If you have oily skin, then you can expect this cleansing brush to effectively remove all dirt and makeup from the skin, leaving no residue. The brush is completely waterproof, so can be used in the shower, and you’ll get a sample sachet of the Olay cleanser to use with the brush, too. Users have said this cleansing brush for face is great for acne prone skin and doesn’t dry out the face after use. The bristle head of this cleansing brush is said to be exceptionally good for exfoliating acne prone skin in a gentle way. It also comes with a silicone brush head for all other skin types to help with daily pore cleansing and brightening your complexion. It is dual speed with a 360-degree brush rotation which ensures you get the most thorough and even cleanse. This brush is fully waterproof, cordless and comes with batteries included. 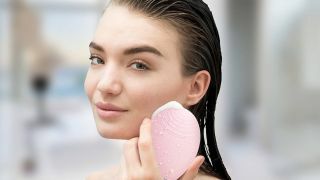 If you’ve never used a facial cleansing brush before and you’re not sure if it is right for you, then this entry-level cleansing brush could be for you. It’s affordable, and comes with three different brushes as well as three different modes. It even includes a body brush for total exfoliation. It’s small and lightweight making it easy to take on your travels, as well as waterproof and rechargeable for ease of use wherever you are.